Pagi’s daughter was barely a day old and about to experience her first ceremony. 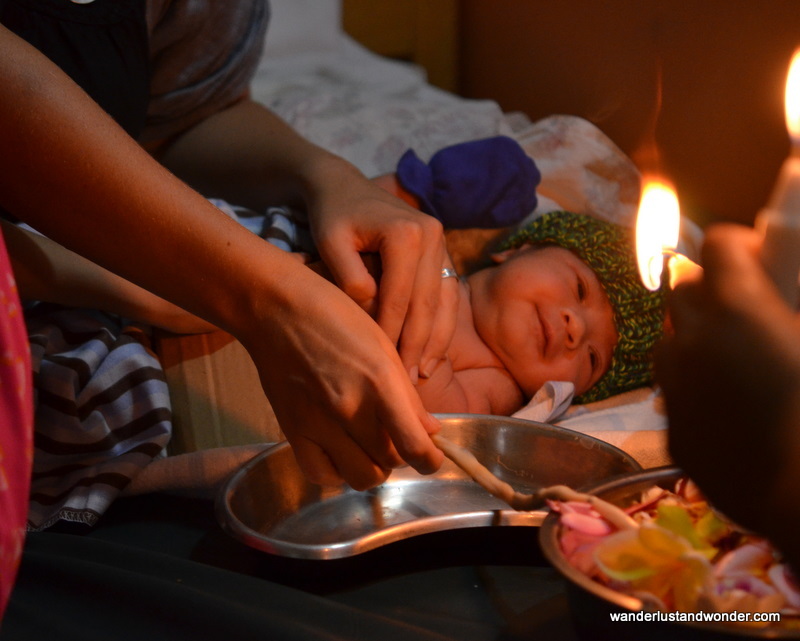 For the midwives at Bumi Sehat, this was a routine occurrence, but for the newborn and myself, it was something new. Bumi Sehat is a tiny clinic in Ubud that provides midwifery, general health, and community outreach services for thousands of ‘marginalized, displaced and low-income people from all faiths and cultures’. The clinic is small and crowded with caregivers and patients, but the mood is cheerful as I observe the daily ongoings. I’ve come to Bumi Sehat to visit Robin Lim, or Mother Robin, as she has come to be called. Robin founded Bumi Sehat in 1995. Her commitment to serving the poor and to promoting holistic health care and ‘gentle birth’ practices have garnered her many admirers from across the globe. On this day, a CNN crew has arrived to film her as she is one of top ten nominees for Hero of the Year. 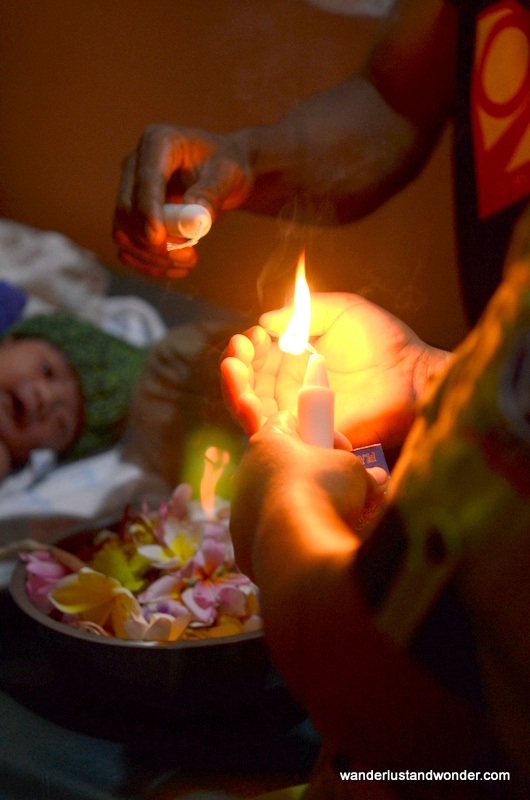 As she chats with the crew, a volunteer midwife invites me to see something special—a cord burning ceremony. Having never heard of this practice I was curious to see what it would entail. Stacy, who is the volunteer coordinator for the foundation, takes me into a small room, where a beautiful newborn surrounded by her family is about to be separated from the placenta. The placenta has been placed in a bin and covered in flowers. 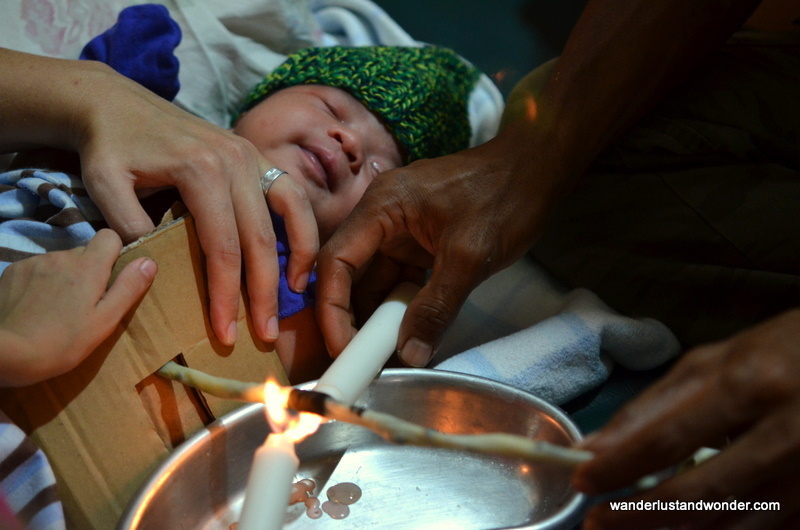 Candles are lit and handed to the parents and cardboard is placed between the neonate and the action to protect her from the heat. The room is completely calm. Pagi’s daughter peers contentedly at the candles, attracted no doubt to their gentle glow. Stacy and the baby’s parents start to sing a lullaby as the flame is placed on the cord. The process of severing the cord with fire was one that started out of hygienic necessity. Following the 2004 tsunami in Aceh, Bumi Sehat established a clinic to offer medical care to disaster victims. They found it difficult to keep tools sterile, and needed a way to cut the umbilical cord in a hygienic and safe manner. Thus, they used candles, which were readily available and the most practical means of hygienically cutting the umbilical cord. 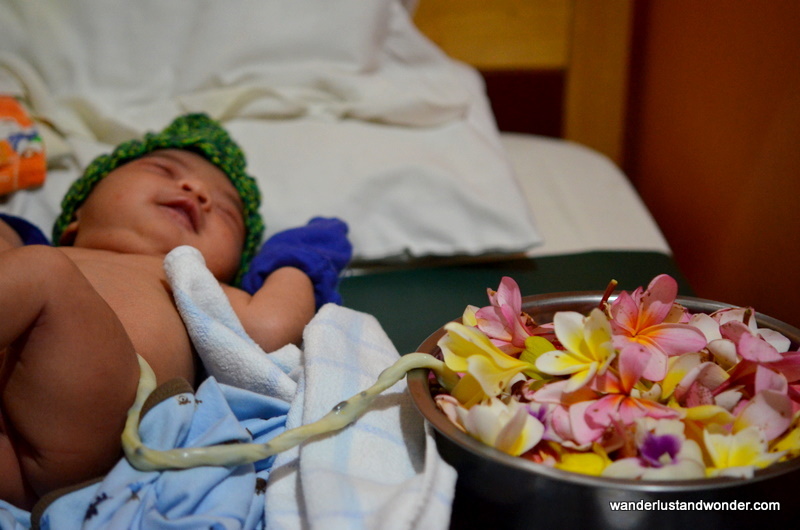 What was born out of necessity became a special happening offered to interested parents in their Ubud Clinic. Illuminated by candle light and soothed by a gentle song, Pagi’s daughter remained remarkably calm yet alert during the ten minute ritual. Usually cutting the cord is left to the attending Doctor, or perhaps the father, but here, surrounded by her family the baby was freed in a beautiful and meaningful way and one where her mother was able to join too. Practices like these, where the whole family participates alongside the health care provider, make Bumi Sehat a sought after affair by wealthy patrons from Jakarta as well. But the clinic remains a donation-based center, dependent upon kind patrons and generous benefactors, in a continuing effort to provide for those who otherwise could not afford quality healthcare. Thus Robin is on the campaign trail. Tirelessly encouraging people to vote for her on CNN’s website, as the prize money would mean Bumi Sehat would finally be able to build a proper clinic, with room and facilities to appropriately accommodate the volume of people and the variety of medical concerns they see/address every day. ☞ To find out how you too can support this tiny clinic with a big heart visit: Bumi Sehat Online and please vote for Robin for CNN’s Hero of the Year award. It is wonderful that you had the chance to witness such a moving scene. Your words and photos captured the essence of Mother Robin’s magnificent heart and endless work. Now we pause and reflect on the significance of this ceremony as we simultaneously vote so that she might fulfill her dream. Awesome story Mel…. I am going to vote right now. your words and images are so beautiful. I have never been happier to see my own hands in photographs than these. thank you for what you eloquently captured. i appreciated the respect you showed and your patience with us that day. you are a wonderful woman, mel! I linked below my wish for Robin Lim’s birthday, which was yesterday so people can donate to Bumi Sehat. Blessings on you and your family. Thank you Stacy! Visiting Bumi Sehat was a moving experience for me. Thank you for letting me follow you around! The work you all do is incredible and so inspiring. Please keep in touch! I found Stacy’s link. Here is her beautiful Birthday Wish, http://wishes.causes.com/wishes/411288 Thank you for sharing! Happy Birthday Stacy! Yay! It’s actually Robin’s birthday on Nov. 24th so I try to raise $2400 in 24 hours on the 24th. we’re lagging a bit this year- maybe b/c it was Thanksgiving Day here in the USA? I can’t think of a better way to give thanks, than by contributing to Bumi Sehat & inspiring gratitude in others too. gorgeous photos! and what a truly lovely blog! I really salute as the mother of this one ..